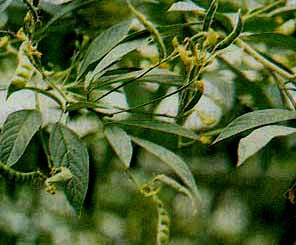 Gude or bean cultivated pigeonpea in Java as a food crop or used as green manure. These medical plant can be found from the lowlands to 2,000 m above sea level. Growth requires a lot of sunlight and are not resistant to moist conditions. Grows as an upright shrub, 1-2 m. high Woody stems, round, grooved, hairy, green-brown. Leaves gathered three, short-stemmed. Leaves oval to elliptical, scattered, end of the base and tapering, flat edge,bone pinnate, green color. Inflorescence compound, out of the armpit leaves, the shape of bunches, bouquets 15 .- 30 cm, crown shape of butterflies, yellow. Pods, 4-10 cm long, hairy, flat, green. Seeds small, round. Seed coat color can be grayish-white, yellow, brown or black. Young pods can be eaten.medical plant gude could be Propagation by seed. PART USED: Leaves, roots, and seeds. USE: Leaves efficacious to overcome: - jaundice (jaundice), - pain in the mouth, - cough, and diarrhea, abdominal pain. Efficacious to address the root: - worm - phlegm cough, and wounds. Seed of this medical plant efficacious to overcome: - bruising.